Remember when you were a kid and mom would hang one of your drawings on the door of the fridge? How good did that make you feel to be recognized? To have your wonderful talents displayed for everyone to see? When we celebrate the work of a family member or a team member it is an affirmation of belonging and a recognition of the contribution any individual can make to the group. A great team truly is stronger than the sum of its parts and this goes for companies just as much as it does for families. Lots and lots has been written about the importance of company culture; how it is critical to growth, to innovation, and to creativity. Too often culture is simply used a buzzword — a simplistic way to say that our company is cool. Culture is not about cool, it is about respecting the contribution of each individual, empowering them to do their best, teaching them that they can and should empower others and, most importantly, making each member of the team feel that they are a part of something bigger, something important. How a company goes about doing this has everything to do with the values they promote and the atmosphere they create. The values a company works to instill and nurture have to be owned by everyone who works together at a company. Managers can not simply make statements about values, they need to take time to teach values, to live by those same values, and to encourage everyone to do the same. This can start with simple affirmations of each team member’s contributions to the company. A great example of this is how a few years ago Ross started a wonderful project: whenever a customer would write to us with kind words about how one of our folks helped them, he would print it out and tape it to the front door of our office. Over time it came to include dozens of these customer testimonials and it is always noticed and commented by visitors and guests. Every time a new compliment is hung on the door, the entire team beams and the individual recognized has a wonderful proud moment. What this teaches is one of the values we try hard to live by, which is that we are customer-focused and every one of us has a responsibility to serve our users as best we can. Recognizing that the ‘team’ is the most important asset a company has means showing, every day, that we value one another. Company culture needs to reflect this simple truth and there are easy ways to do so. Start by spending time with your fellow team members: outings, parties, special events, and special projects are great ways to help build strong bonds. 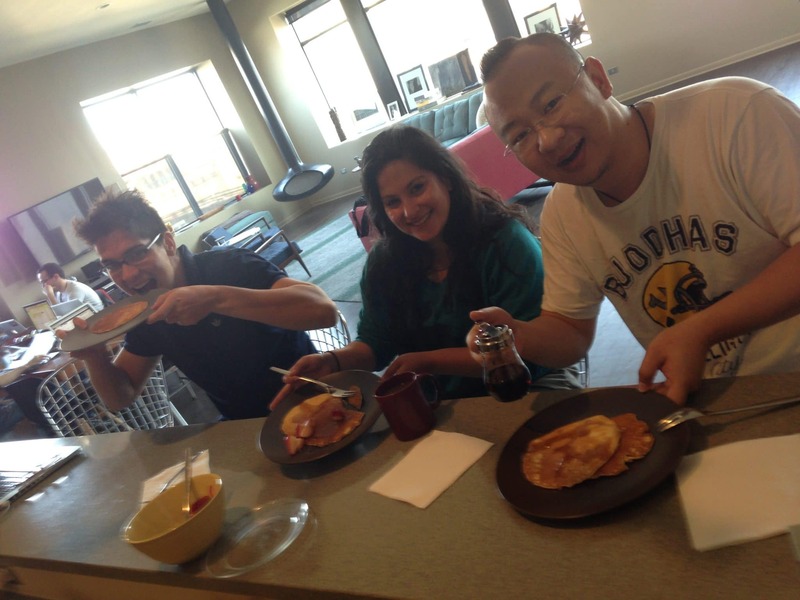 It can be even simpler than that; for instance when the team came to my home recently for several days of work together I promised pancakes for all. By taking 30 minutes out of my busy day to cook for everyone I delivered the sincere message that I valued them, liked, them and wanted to have fun with them. Plus, pancakes are delicious. Every company, every manager, must look for ways to build bonds, support one another, celebrate every worker’s accomplishments, and instill the core values that a company is built on. Plus, can you think of a better way to message how you value your team than by hanging their drawings on the fridge and eating pancakes together? I can’t. Photo: Dio, Bianca and Yang enjoying cS culture!